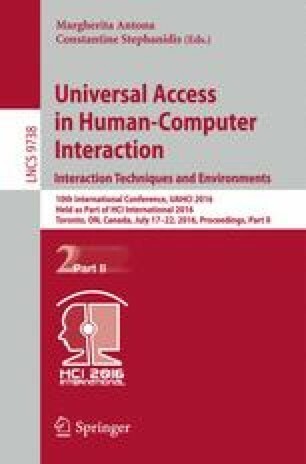 We have researched gesture interfaces for persons with motor dysfunction who could not use normal interface switches. The users have cerebral palsy, quadriplegia, or traumatic brain injury, and they have involuntary movement, spasticity, and so on. The purpose is to provide these users with easy and low-priced interfaces for operating PCs. To develop a low-priced interface, we used a commercially available image range sensor and developed a non-contact and non-constraint interface. For this purpose, we have collected various gestures of many persons with motor dysfunction and classified them into three types of users. We have developed seven types of gesture interfaces for users and applied three different modules to three subjects. We describe the basic structure of the gesture interfaces and their long-term evaluations. This work was supported in part by a Health and Labor Sciences Research Grant: Comprehensive Research on Disability Health and Welfare in 2014. The authors gratefully acknowledge the many who have supported and encouraged this work.